Welcome to the Grand Teton National Park Information Page. Grand Teton National Park is located in the northwest corner of Wyoming in Teton County, and is only a few miles south of Yellowstone National Park. The same visitors pass is good in both parks. The closest major airport is Salt Lake City, Utah or fly into Jackson Hole Airport via commercial and charter air service. Local taxi, shuttle and rental car services are available from the airport. Reserve your rental car when reserving your flight. Rentals are often in short supply. 1. Highway I-15 North to McCammon, Idaho and then taking state road 30 East to state road 34 to Freedom, Wyoming and highway 89 North to the park. 2. The next option is to take I-15 North, take the Logan, Utah exit to highway 89 North and enjoy a nice scenic drive through Utah, Idaho and Wyoming to the park. Don’t miss the world’s largest elk antler arch over the road in Afton, Wyoming. We stayed at the Allreds cabins in Afton in Star Valley and it is a beautiful area. 3. You could also take I-15 North to Idaho Falls, Idaho and then take state road 26 East to state roads 31 and 22 into the park. A beautiful ride into the park. Another variation to this, would be to take 26 all the way to 89 and then drive north to the park, this is a beautiful drive along Palisades Reservoir. 4. If you are traveling on I-80 in Wyoming, you could take state road 191 North to 89 North to the park. Or you could take state road 312 North along the Green River to state roads 189 North and 191 North to 89 North and on into the park. 1. Head for I-15 and take either numbers 1 or 3 above. 1. From I-80 at Rawlins, Wyoming you could take state road 287 North to state road 26 and on into the park. You could also go into Riverton, Wyoming and on to state road 26 and to the park. 1. If you are coming from the north, northwest or northeast, head for 89 South to Yellowstone and enjoy the park on you way through to the Grand Tetons. Teton Range – An active fault-block mountain front, 40 miles long (65 km), 7-9 miles wide (11-14.5 km). Highest peak – Grand Teton, elevation 13,770 feet (4198 m). Twelve peaks over 12,000 ft (3658 m) in elevation. Jackson Hole – Mountain valley, 55 miles long (89 km), 13 miles wide (21 km), average elevation 6,800 feet (2073 m). Lowest elevation at south park boundary, 6350 feet (1936 m). Climate – Semi-arid mountain climate. Extreme high: 93 degrees F (34 degrees C). Extreme low: -46 degrees F (-43 degrees C). Average snowfall – 191 inches (490 cm). Avg. rainfall: 10 inches (26 cm). Snake River – Headwaters of the Columbia River system, 1056 miles long. Approximately 50 miles lie within Grand Teton NP. Major tributaries: Pacific Creek, Buffalo Fork, and Gros Ventre River. Lakes – Seven morainal lakes at the base of the Teton Range: Jackson, Leigh, String, Jenny, Bradley, Taggart, and Phelps. Jackson Lake: 25,540 acres (10,340 hectares) maximum depth 438 feet (134 m). Over 100 alpine and backcountry lakes. The original Grand Teton National Park was established by Congress on February 29, 1929. (45 Stat., 1314). The park encompasses approximately 310,000 acres of wilderness and some of the most beautiful mountain scenery in the western United States. John D. Rockefeller, Jr. Memorial Parkway legislation established an 82 mile parkway between West Thumb in Yellowstone National Park and the south entrance of Grand Teton National Park. This area included approximately 24,000 acres of land. There is approximately 100 miles of paved roads in the park. There is nearly 200 miles of trails for hikers to enjoy in Grand Teton National Park. Facilities for visitors with disabilities include restrooms, picnic tables, and a limited number of campsites. There are approximately 100 miles of park roads and 200 miles of trails throughout the park. Most park trails are rough rock or dirt and are not accessible to visitors with disabilities. There are many asphalt trails in the Jenny Lake area, some of which are accessible. Some trails may begin as asphalt and change to dirt or gravel shortly thereafter. “Leave No Trace” philosophy of backcountry travel is very important in the Grand Teton backcountry experience. Without it, the wilderness itself is threatened with extinction. If you enter the backcountry of Grand Teton National Park with an informed about and committed to a minimum impact wilderness with ethic attitude, you can have an unforgettable experience and can share in the responsibility for preserving this place. An enjoyable visit to this heavily visited park requires some measure of planning and timing. Some basic services such as rental cars, rental equipment and lodging are sold-out every day. Reservations should be considered essential for main season visits. Campgrounds are frequently filled by noon, with the possible exception of Gros Ventre Campground near the park’s south boundary. Arrive early, plan carefully and seek information at park visitor centers and ranger stations. 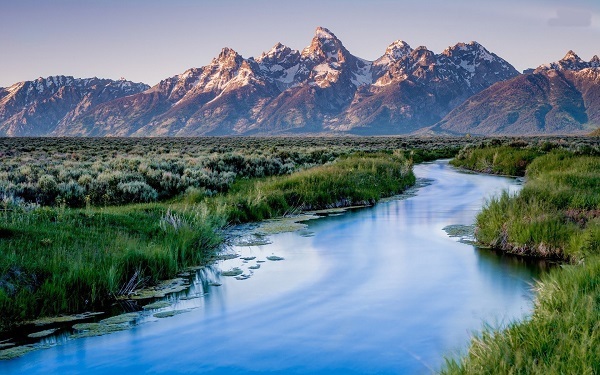 Most of Jackson Hole, a 40-mile long, 15-mile wide valley surrounded by mountains, lies within the Grand Teton National Park and the John D. Rockefeller, Jr., Memorial Parkway. Within the park and parkway, approximately 100 miles of paved road await the bicyclist. Numerous scenic turnouts provide spectacular views of the impressive Teton Range. To enter or leave the valley, bicyclists may need to cross one or more mountain passes. Some roads in the park predate today’s bicycling popularity. Most roads have paved marked shoulders, providing limited space for safe bicycling. Some roads have only a very narrow shoulder, or lack one altogether. Use extreme caution. All vessels must be registered with the park annually. A small fee is required. Permits may be purchased at Visitor Centers or Ranger Stations. Lakeshore campsites are located on Jackson Lake, and for canoes, on Leigh Lake. Camping is not permitted on the rivers. Location: Southwest area of the park near Bradley Lake. Hike: 6 miles roundtrip. Strenuous. The hike to Bannock Falls starts at Lupine Meadow Parking area which is at the end of a spur road off Teton Park Road 7.5 miles north of Moose Junction and south of South Jenny Lake Junction. The small unpaved spur road leads 1.7 miles to the parking area. This is the starting point for Cleft and Spalding Falls hikes. Location: Just west of Jenny Lake – west central area of the park. Hike: 1.2 or 5.2 miles roundtrip. Hidden Falls is not really a falls, but a 200 foot cascade. There are two ways to get to the trail on the west side of Jenny lake. One is by a shuttle boat from the Jenny Lake east shore boat dock at the southeast end of the lake. The second route to get to Hidden Falls is by hiking around the south end of Jenny Lake to the trail to Cascade Canyon (this adds four miles roundtrip to the hike). While at Hidden Falls, it is well worth an extra .5 mile hike to Inspiration Point for a magnification view of the Jenny Lake, Jackson Hole, the Gros Ventre and Wind River Mountains. Five National Park Service campgrounds are available within the park: Gros Ventre Campground, Jenny Lake Campground, Signal Mountain Campground, Colter Bay Campground, and Lizard Creek Campground. A Wyoming fishing license is required to fish in the park. Non-resident 1 day, 5 day, 10 day and season licenses are available at local sporting stores. Non-residents under 14 years of age and accompanied by a person possessing a valid Wyoming license may fish free. Fish caught by persons under 14 are included in the accompanying adult’s creel limit. There are approximately 100 miles of park roads and 200 miles of trails throughout the park. Most park trails are rough rock or dirt and are not accessible to visitors with disabilities. There are many asphalt trails in the Jenny Lake area, some of which are accessible. Some trails may begin as asphalt and change to dirt or gravel shortly thereafter. Lodging within the park is available through park concessioners: Flagg Ranch, Grand Teton Lodge Co, Signal Mountain Lodge Co, and through Dornan’s Spur Ranch Cabins. Stock may be used on established trails, however some trails are closed to horses and llamas. There are special campsites and rules for overnight stock use. Pets are welcome in the park but regulations restrict their activities. Pets are permitted in the park with certain restrictions. A good rule is a pet may go anywhere a car may go: roads and road shoulders, campgrounds and picnic areas, parking lots, etc. Pets must be on a leash and under physical restraint. Pets are not considered pack animals. Summer walks, talks, and evening campfire programs. Inquire at park visitor centers and ranger stations for schedules. When snow depth is sufficient, snowmobile routes including the Continental Divide Snowmobile Trail (CDST) will be opened within the Grand Teton and John D. Rockefeller, Jr. Parkway. For the unplowed portion of the Teton Park Road, the snowmobile season is generally mid-Dec through mid-Mar. Moose Visitor Center features Greater Yellowstone Area and rare and endangered species exhibitry, video room and an extensive book store. Jenny Lake Visitor Center features Geology exhibitry, a relief model and book sales. Colter Bay Visitor Center features an Indian Arts Museum, an auditorium and a large book store. Flagg Ranch Information Station features information about John D. Rockefeller and the Greater Yellowstone area and book sales. In an amazing variety and profusion bloom through the warm months. Sagebrush buttercups follow receding snowpacks. Springbeauties, yellowbells and steershead blossom closely behind, growing close to the ground for protection from late snowstorms or frost. Brilliant colors covers the valley floor during late June, the peak of the wildflower season. Meadows of scarlet gilia, balsamroot, lupine, larkspur and wild buckwheat bloom in multiple combinations or red, yellow, blue, purple and white. Following the valley display, many of the same wildflowers flourish in meadows along canyon trails. Visitors to the alpine zone discover brilliant cushions of color that hug the ground, including the official flower of the park, the alpine forget-me-not. Long, cold winters. The first heavy snows fall by 01 Nov and continue through March with snow and frost possible during any month. Summer days in the 70’s and 80’s with cool nights in the 40’s. Summer thunderstorms are common. Mild to cool temperatures through September and October. Raingear recommended during spring, summer and fall. Sub-zero temperatures are common throughout winter and demand multi-layered clothing, hats, mittens and cold weather boots.